Today we are going to travel to Beaconsfield in the United Kingdom, where interior design professionals Zodiac Design built a family home that truly has it all. As we explore each section of this home, from the outside in, we will see just how beautiful a family home can be, while still managing to maintain its comfort and functionality. Spread over three-storeys, we will also see how every inch of this home has been impressively utilized. George Bernard Shaw once said, A happy family is but an earlier heaven. Today, we will see how a gorgeous piece of architecture and fabulous interior design can contribute to a very happy family. From the outside, we can see that this looks like a typical English home in the suburbs, but with some contemporary twists. The brick facade works in harmony with the red roof, creating a very warm and inviting exterior look and feel. The brick is interspersed with glass windows and doors, which open the home up onto the beautiful terrace and lavish garden. And what a garden it is! In this image we truly get a sense of how much of a role a garden plays in a design. A manicured lawn and neatly arranged trees and flowers can set the tone for a beautiful facade. The patio also expands the living space of the home, offering a lovely outdoor area where the family can relax and enjoy the sunshine. Could you picture a home like this in Canada? In this image, we can see how the home has been formed in an L-shape, which creates a very neatly packed home. The garage on the left is a wonderful addition to any family home and would suit any Canadian household. Not only does it protect the car and other items such as bicycles and skateboards, but it keeps them neatly stored away. This keeps the exterior look and feel looking very organized and clean. Have a look at these 6 extraordinary garages to protect your car for inspiration for your own home. The front door introduces wood into the design, bringing a more warm and earthy touch to the space, which contrasts beautifully with the brick. 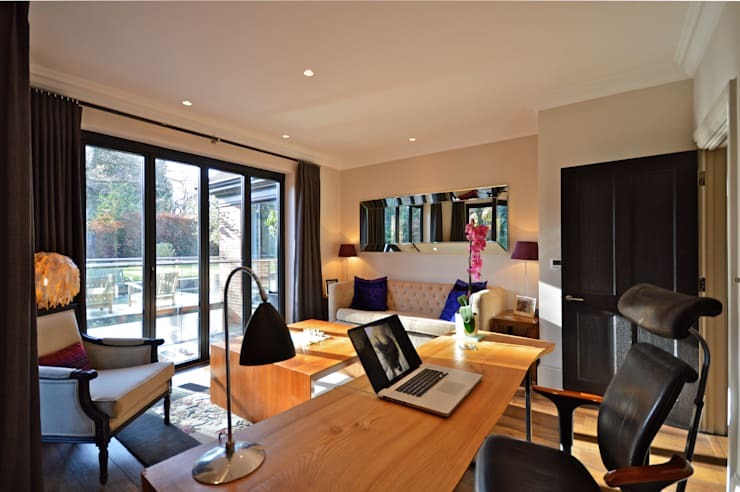 Family homes often need offices spaces where the kids can do their homework or mom and dad can catch up on emails. This doesn't mean that it has to be a bland or dreary space. In fact in this modern and stylish family home, we can see how the office space is packed with natural light, which flows in through the large glass windows. It features a stylish wooden desk as well as a comfortable looking sofa, armchair and coffee table. This is the ideal space for catching up on work or having more serious gatherings. The soft and neutral tones throughout also contribute to a very homely environment, so it wouldn't even feel like you were doing work if you had to spend some time in this room! 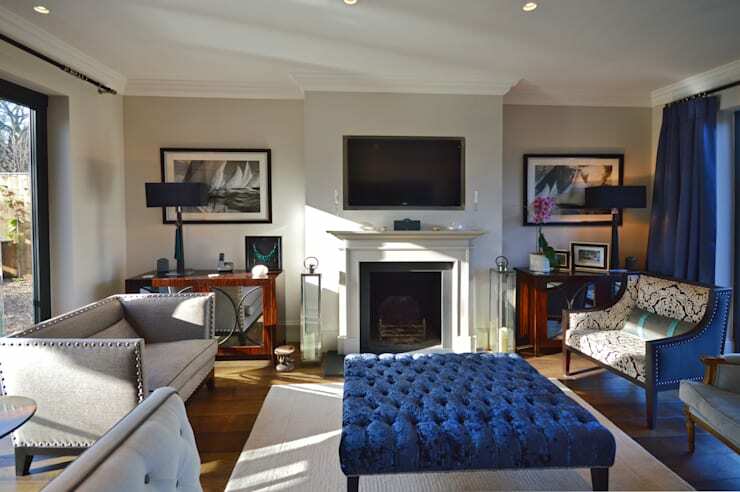 Don't you love how the royal blue cushions and orchid add a splash of colour to the space? Stairs are often a functional addition to a home, getting us from point A to point B. However, they can also form a stylish decor element, introducing a more classic or modern look and feel to the environment. In this home, the staircase is classic and gorgeous in white with a dark grey runner down the middle. The white banister is elegant as well as functional. 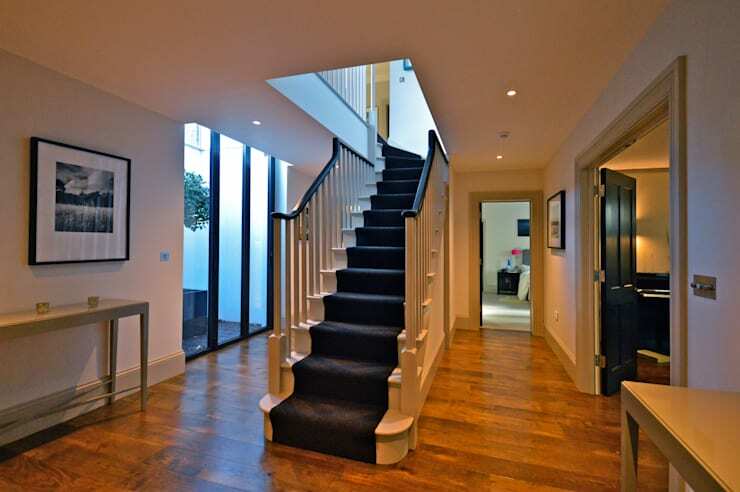 The white staircase contrasts beautifully with the wooden floors, resulting in a very aesthetically appealing design. If you like a more modern look and feel to your home, have a look at these 15 fantastic floating stairs for inspiration! The living room is one of our favorite rooms in the house, with its grey tones and splashes of royal blue, just like we saw in the home office. A fireplace forms the central focal point of the space, while also serving as a functional element. This is a great way to create a cozy environment in winter! With the Canadian winter approaching, you may want to have a look at these fireplace products for inspiration! The artwork chosen in this room plays a big role in adding character and charm to the space. Remember that your home should reflect your personality so don't be afraid to go for pieces that speak to who you are. Earlier we mentioned that every room in this house has been utilized and now you can see what we mean! 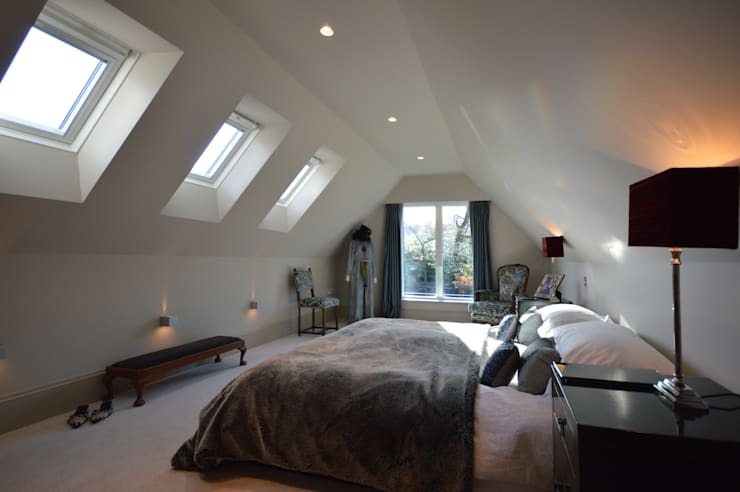 The attic has been converted into a very modern and chic bedroom, packed with natural light thanks to the large glass windows and the skylights that have been inserted along the length of the ceiling. The designers have gone for a predominantly white tone throughout this space, but have added a bit of a vintage touch, introducing blues and browns to the design. Bedroom lighting is incredibly important for ambiance (and perhaps some romance too), which is why lamps have been included throughout this space along with dimming lights in the ceiling. This create a soft glow in this room that is functional but not too over powering. 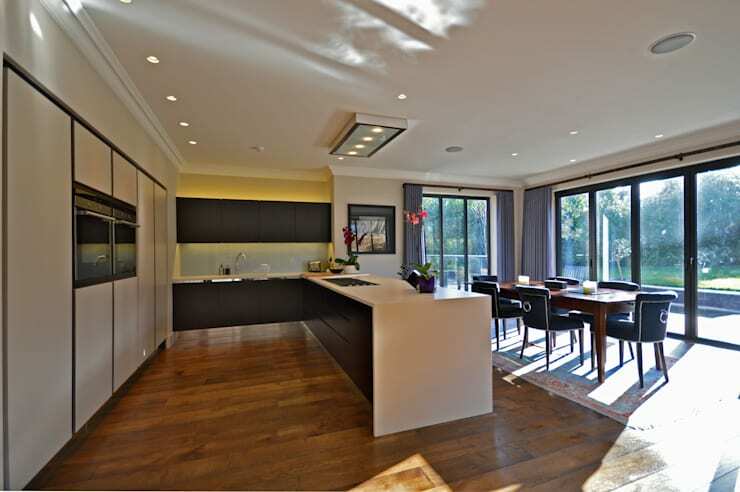 A very modern and stylish way to layout a kitchen and dining room at the moment is to create an open plan space where the rooms flow into one another. In this house, the kitchen is slightly separated from the dining room by a white kitchen island. This is a great trick! It still allows the chef to interact with diners, but keeps the cooking area separate. A kitchen island also adds extra storage and counter space to a small kitchen, while visually expanding it. The designers have gone for a minimalist look and feel in this space, keeping the counters bare. The dining room is a wonderfully warm space with an abundance of natural light. It also opens up on the exterior space if necessary. 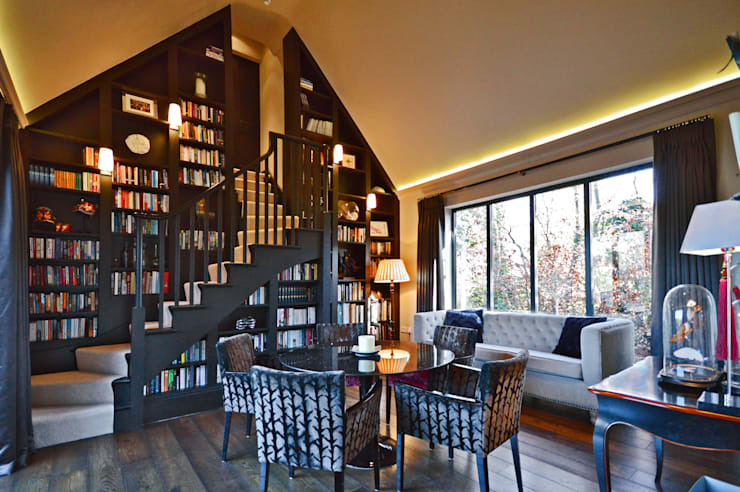 We end off our tour of this home in the library, which features a bookshelf that runs along the entire wall, right up the ceiling. This creates a very dramatic visual effect, which is further enhanced by the staircase that runs through the middle of it. This truly is a family home that has it all! The chocolate wood of the shelves contrast beautifully with the neutral furniture and the wooden floors. Again lighting plays an important role here, with lamps included throughout to create a very warm and cozy environment. There is also a comfortable sofa in this room as well as a seating area, providing plenty of little spaces for family members to relax with their favorite book or pour over the newspaper. Have you ever seen something so charming? Which parts of this house would you like in your own home?